Lasers and aesthetic procedures have transformed dermatology practice. They have aided in the treatment of hitherto untreatable conditions and allowed better financial remuneration to the physician. The availability of a variety of laser devices of different makes, specifications and pricing has lead to confusion and dilemma in the mind of the buying physician. There are presently no guidelines available for buying a laser. Since purchase of a laser involves large investments, careful consideration to laser specifications, training, costing, warranty, availability of spares, and reliability of service are important prerequisites. This article describes various factors that are needed to be considered and also attempts to lay down criteria to be assessed while buying a laser system that will be useful to physicians before investing in a laser machine. Lasers have become an integral part in today's aesthetic dermatology practice. With the advent of new technology, more sophisticated devices are being developed that are both relatively safe and effective even in darker skin types. With increasing number of machines being available to choose from, it has become a difficult and often confusing task for the physician to decide upon which system to buy. Multiple technologies such as lasers, lights and other non-light energy devices are available. Choosing a laser system, maintaining the machine and after-sales service, are all vital aspects to having a successful laser practice. Likewise machines from different companies and from different countries varying in specifications and cost are available, making it difficult for a practitioner to judge which one to buy. In addition, there is a lot of hype in the marketing and exaggerated promotional material used by the laser companies, each staking claims that their machine is the best. There is considerable ambiguity with regards to the post-sales maintenance policies including annual maintenance contracts (AMC) and annual service visit (ASV). Most purchasers are unaware of the type of insurance and other terms and conditions that need to be considered for their machines. The aim of this article is to focus on practical aspects before purchasing a laser. In addition other lasers which have found acceptance include non-ablative 1550 nm fractional erbium glass laser,  585 and 595 nm pulse dye laser for vascular lesions,  and excimer 308 nm laser and lamp for vitiligo and psoriasis. Intense pulse light systems and light-based targeted phototherapy machines also have their place in practice. These broad technologies have well-established roles. Choosing a laser system, between the available models in these technologies will depend on the variables such as pulse duration, spot size, energy and fluence, consumables and cost. First and foremost, the buyer should learn basic laser physics, indications for lasers, different technologies and complications. These can be learnt either by attending workshops, symposia, at conferences and attending established laser centres. The physician should be aware of the prevalence of different dermatological and aesthetic problems in the community and then decide which laser would be most suitable for practice in that area. Patients' attitudes, paying capacity and marketing opportunities need to be assessed. 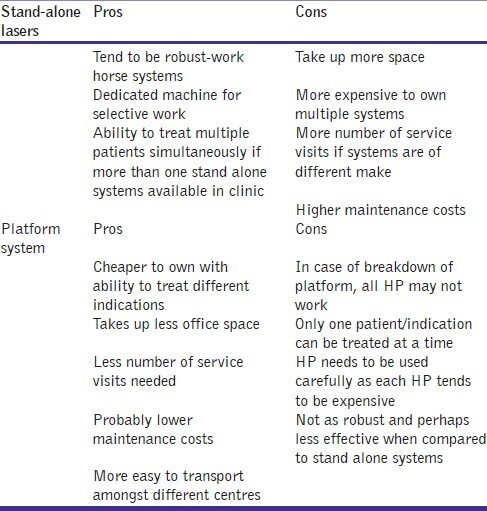 While the choice of a laser system depends on individual situation, some general recommendations are outlined. The first laser to be bought is either a hair removal laser or a fractional ablative laser. The wide prevalence of hirsutism, increased awareness among women, and wider acceptance of the technology has made the hair removal laser a necessity. However, some doctors have preferred a fractional laser as a first laser as many beauty clinics have started laser hair removal and there has been a proliferation of hair removal machines in some towns and cities. The ablative fractional laser is popular in view of its safety and wide variety of applications. Q switched Nd:YAG laser for treating pigmented lesions is the next choice. The current nanosecond lasers have established their role, but the cost is high and hence the machine is usually the third choice. Intense pulse light systems (IPL) are not lasers but polychromatic (multiple wavelength) light devices that use cut-off filters and allow targeting of different chromophores and have the advantage of treating different indications with one system. Although the IPL systems are cost-effective they are generally not as effective as laser systems. Excimer lamp devices tend to be cheaper than the excimer 308 nm lasers and are quite effective in management of vitiligo and psoriasis. They can be considered as they are cost-effective, effective and safe in dark-skin patients. Pulse dye laser and excimer lasers are expensive lasers, and are found in only few centres and hence will not be discussed further. Laser systems are available either as stand-alone or platform systems. Stand-alone systems tend to be of single wavelength with one hand piece (HP) designed for specific purposes such as a long pulse alexandrite 755-nm laser for laser hair reduction. Platform systems have the ability to attach multiple hand pieces to the machine and have the ability to deal with various indications. The hand pieces could be a hair removal HP or an IPL HP for treating vascular lesions or even a near infra-red HP offering skin tightening treatments, etc. At any given time one or two HP can be attached to the system and can be changed as desired. The software of the system recognises the HP attached and the settings can thus be changed as needed. Each of these two systems has its advantages and disadvantages and these are enumerated in [Table 1]. Stand-alone systems are obviously suited for large practices and established practitioners' with big budgets, while platforms are more suited for beginners or those with multiple clinics and if different doctors wish to share the machine. Becoming members of societies dedicated and focused on laser dermatology and attending their meetings and interacting with experienced users, listen to lectures, attend hands-on workshops, etc. Educational and marketing material provided by the company. Training provided by the company on the machine, observational and hands-on training with another expert or on-site. Visit to the factory/headquarters of the parent organisation to access the commitment, research and development if and when possible. The buyer should check the company's website for details such as specifications, the scientific and white papers and testimonials. Know the company: Before buying, the first thing to do is to identify the correct person or organisation or company, whether they are a company or act as Messer (M/s), whether they have registered their organisation/company under companies act/local body or not; what is their total strength of man power ; do they have the provision of provident fund (PF) account; do they have a website which provides full details; how many machines have they supplied; how long are they in business; how big is the company and do they market a wide variety of machines? These points can help ascertain if the company is genuine or not. A large spot size is preferable for laser hair removal. A large spot size allows deeper penetration and allows faster treatments during the laser procedure. A spot size of 10-18 mm is available in conventional LHR systems. Newer low-fluence high repetition rate hair removal systems have even larger spot sizes. Correct wavelength of filters, variable on time and off time, the HP of IPL should have built-in cooling. Publications in peer-reviewed journals on the laser technology-to access the efficacy, side effects profile of a given system. The articles can give a clue to parameters used which can serve as a starting point for new users. Feedbacks from other users of the system in question: Always make it a point to ask users about their experiences with the machine. Sometimes it may be helpful to ask a competitor company for an opinion about the machine for a frank assessment. Demonstration: Always insist for a demonstration of the system before buying. The machine should be kept in the clinic for at least two treatment sessions and should be tried on different types of patients. Engineer's training and expertise: Try to understand if the marketing person or engineer of the company has some basic scientific knowledge about the laser machine, the training they got from the parent manufacturer abroad, etc. This is very important as the technical knowhow to service is the key to maintenance. Many laser manufacturers provide training to service personnel in their plant. This needs to be verified. Cooling: Most lasers require some form of cooling for protection of the epidermis immediately before, during and immediately after a laser procedure. Many devices have built in cooling either in the form of cryogen spray or contact parallel cooling or simultaneous air cooling. It is important to ensure that cooling is working properly to prevent any accidental epidermal injury. Air cooling systems such as Zimmer require regular cleaning of the filter for ensuring optimal performance. Always check the cost of cooling machine and include it in your budget. 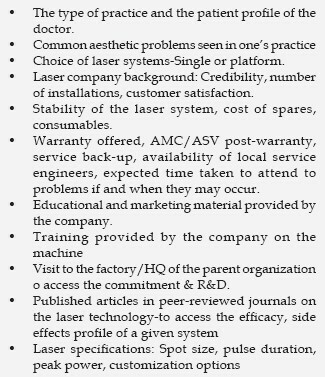 Laser System manual: Each system comes with an elaborate manual with trouble shooting guide. Always read the manual thoroughly and familiarise with it and store it in a place where it is easily accessible. Laser safety eye glasses and corneal eye shields: All lasers are shipped with their specific eye protecting glasses with the recommended optical density (OD) to block out the harmful rays from entering the operator's eyes. These are to be worn during the laser procedure by the operator and any other person present in the laser room. Ensure that the glasses are in good condition upon taking delivery of the system and take care in maintaining them as they tend to be expensive. External metal/plastic opaque eye shields are also provided with the laser to be worn by the patient during the procedure. Registration documents of the clinic. Personal documents such as identity, address proofs, taxation documents. Advance: Once a price is negotiated, and a contract is signed, an advance amount is sought by the company. Generally this should not be more than 25% of the total amount. A proper receipt clearly stating the cheque number and the amount needs to be obtained. Clause for balance payment, with date of repayment; installments, if any, need to be specified. Dollar /foreign currency value: Since many machines are imported, the price often depends on the price of dollar/other currency which are subject to market fluctuations. This should be properly discussed and proper understanding reached with respect to market fluctuations of currency. Check the cost of the machine mentioned and note if there is any undervaluation. DO NOT UNDERVALUE THE MACHINE FOR ANY REASON. Check if all costs are mentioned: Taxes, customs, transportation, insurance while transportation and installment costs. Warranty: Warranty should include all parts of laser; check the fine print and see if there are any exclusion clauses. Check if the warranty is subject to any specification of laser room and associate devices such as vacuum evacuator or air conditioner. Check the frequency of servicing, need for distilled water replacement if any. Sometimes the company or parent organisation may offer an extended warranty or extra service that should be in writing and mentioned in the contract. Clause on repair: Check how many hours/days will it take to attend to breakdown? Rough estimate of time frame to repair/replace parts? Installation of a standby system while the machine is being repaired so that work will not be affected should be asked for. Taxes can be levied while transporting the machine from the port to the place of installation. Proper documentation needs to be done for this and done accurately. Most of the laser machines are delicate and not supposed to be shifted to various centres. It does affect the life of the machine. Check if such movements can be done. This should be done from the company representative himself and not by anyone else. During the time of installation, check if the laser room has adequate air conditioning, space for movement and other requirements - ask him to specify that this is done. A satisfactory installation report should be sought and kept. Hands on training is to be provided to the doctor and staff regarding usage, safety and maintenance of the laser. Some lasers need some optics to be cleaned periodically, de-ionised/distilled water to be topped up and filters to be cleaned or replaced. These have to be understood and learnt by the doctor and staff handling the system. After training, insist on a certificate of hands on training issued in the names of all staff who may handle it. Before the purchase, a doctor should communicate with the parent organisation via phone or email regarding the serial number of the device and the date of manufacture. The serial number on the machine at the time of purchase should be noted and mentioned on purchase bill. At the time of taking insurance this number should be mentioned on insurance form. The serial number of hand piece should also be noted and mentioned separately on purchase bill. In case hand piece needs replacement, it has to be proved that it was bought with laser. The manufacturing date of both laser machine as well as hand piece have to be noted separately. It is a good idea to click a picture of serial number of the device upon installation. Ensure that the service engineer gives a service report after each visit signed by him with comments of the performance of the system. It is recommended to know the cost of spare parts from the parent organisation, well in advance; this is helpful for the future course of action. Clinician must take the LMC (labor maintenance contract which is generally 5%-7% of the invoice value, only for servicing) or AMC (annual maintenance contract, which is generally 22% of the invoice value, includes all parts and maintenance), after the warranty period is over. The figures stated above are to give a rough idea and can vary. AMC is also essential for insurance purpose. Insurance coverage is a must following installation of the device. Electronic insurance for the system-that covers all the parts and electronics of the device. Many insurance companies offer electronic insurance that may be cheaper than the AMC offered by the laser companies after the warranty period is over. While taking insurance it is important to specify which parts are covered and mention it in the policy. Fire and burglary insurance and insurance for mobility from one clinic to another also needs to be done. Local partner of the parent company must keep updating the doctor about the road-map of the parent organisation and updates related to the products or devices. In case of a break down, the company should attend to the call within 48 hours or in case of delay in repair, should provide a stand by unit till the repair is done. This should be again mentioned in writing in the laser purchase contract. Get the machine calibrated at regular intervals to ensure sufficient output. As a good number of new lasers are being sold, it is inevitable that many lasers will end up in the used lasers market. Often, a machine which has been under demonstration use by the company may also be supplied. Some tips regarding the purchase of pre-owned systems are summarised below. Cross-check with the original dealer if they are willing to service it upon purchase. 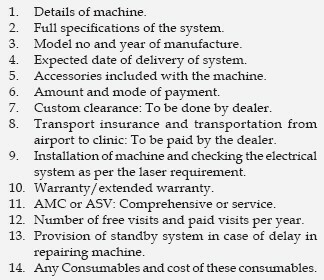 Typically the 1 year warranty most systems come with is void if the laser is sold to another person as this warranty is non-transferable. The new buyer may have to pay a 'recertification fee' to the manufacturer in order for the distributor to service it in future and offer additional warranty. Check the shot count, previous service reports, age of the system and availability of spares. Insure the system during transport to avoid damages that may occur during transport. A good website for checking prices of used medical devices is www.dotmed.com. While buying a used system, ensure that the laser safety eye glasses and corneal shields are also provided and that they are in good condition. User Manuals: Always insist on the original user manual. User video: Videos taken by the original owner while performing treatments gives a good insight into the system performance and technique. How to identify if the machine supplied is new and not perused? It is possible to identify if the supplied machine is new or used by contacting the manufacturer and requesting this information by providing the model and serial number. A check list for signing a contract is shown in text box below. The exact format will vary according to the system, the company, the cost and payment terms and conditions. Before taking the plunge, access your practice profile, decide what lasers are best suited for your practice. Do discuss with your peers and check evidence of efficacy and adverse effects. Always insist for a demonstration of the machine. Choose the right technology and choose the right company. Check the after sales record and cost of maintenance, only then finally purchase the machine. Ensure that a detailed laser purchase contract is made and signed by the two parties as this will allow a healthy and hassle-free relationship between the dealer and the doctor in the future. The authors would like to thank Dr. Shehnaz Arsiwala, Mumbai, India & Dr. Swapnil Shah, Solapur, India for their valuable contribution to the article. 1. Buddhadev RM; IADVL Dermatosurgery Task Force. Standard guidelines of care: Laser and IPL hair reduction. Indian J Dermatol Venereol Leprol 2008;74:68-74. 2. Goel A, Krupashankar DS, Aurangabadkar S, Nischal KC, Omprakash HM, Mysore V. Fractional lasers in dermatology-current status and recommendations. Indian J Dermatol Venereol Leprol 2011;77:369-79. 3. Krupashankar DS; IADVL Dermatosurgery Task Force. Standard guidelines of care: CO 2 laser for removal of benign skin lesions and resurfacing. Indian J Dermatol Venereol Leprol 2008;74:S61-7. 4. Aurangabadkar S, Mysore V. Standard guidelines of care: Lasers for tattoos and pigmented lesions. Indian J Dermatol Venereol Leprol 2009;75 (Suppl 2):111-26. 5. Srinivas CR, Kumaresan M. Lasers for vascular lesions: Standard guidelines of care. Indian J Dermatol Venereol Leprol 2011;77: 349-68. 6. Dhepe N. Minimum standard guidelines of care on requirements for setting up a laser theatre. Indian J Dermatol Venereol Leprol 2009;75:101-10. 7. Olson R. Continuous power to the OR and other critical care areas. Dimens Health Serv 1975;52:29-30. 8. Kerr DR, Malhotra IV. Electrical design and safety in the operating room and intensive care unit. Int Anesthesiol Clin 1981;19:27-48. 9. Alster TS. Getting started: Setting up a laser practice. In: Alster TS, editors. Manual of cutaneous laser techniques. 2 nd ed., Ch 1. Philadelphia: Lippincott, Williams and Wilkins; 2000. p. 2-4. 10. Mackety CJ. Purchasing lasers and related accessories. Hosp Purch Manage 1985;10:7-10. 11. Christensen GJ, Child P Jr. New technology: Mandatory, elective, or hype? Dent Today 2011;30:134, 136, 138.